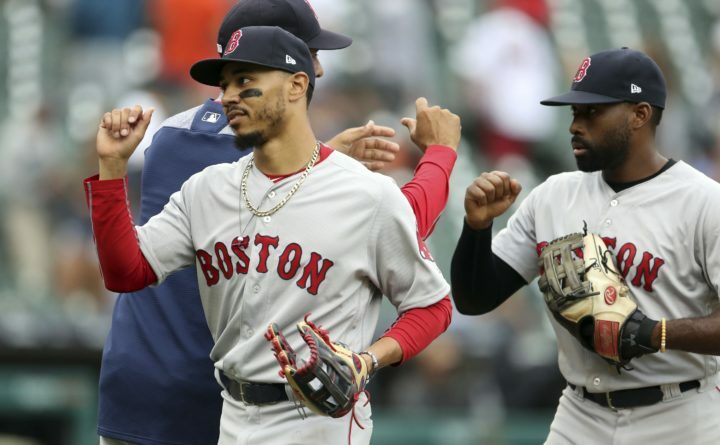 FILE - In this July 22, 2018, file photo, Boston Red Sox right fielder Mookie Betts, front left, and center fielder Jackie Bradley Jr., right, greet teammates after a win over the Detroit Tigers in a baseball game in Detroit. Betts, Bradley and Ian Kinsler have won Gold Gloves for the World Series champion Boston Red Sox. It's the third straight for Betts in right field. Kinsler got his second Gold Glove at second base, and Bradley won for the first time in center.